Galiano Conservancy is Celebrating 30 Years! 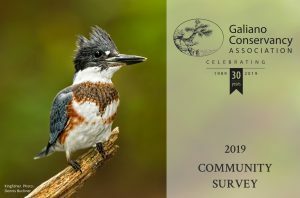 In 2019 the Galiano Conservancy is celebrating its 30th anniversary – an amazing milestone in our work for community conservation on Galiano! This landmark year is an opportunity to look back and celebrate achievements, and to thank all those who have made these successes a reality. Looking forward to the next 30 years, this is an opportunity to come together and collectively refine our vision, to focus our efforts on an inclusive, healthy and resilient future. What do you envision for conservation on Galiano in the next 30 years? What environmental issues facing our island are most important to you? How would you like to see the Galiano Conservancy’s work support your values? We are community-based and prioritize initiatives that support community values and interests. We invite you to share your feedback, ideas and stories in our 2019 Community Survey, and to help shape our strategic direction moving forward. Complete the survey and enter to win a $200 Thrifty Foods Smile Card generously donated by Thrifty Foods in Sidney. Yum! Join our mailing list and stay up to date on events and news! Share your throwback GCA photos for our Anniversary Scrapbook! We’ll feature these photos at our Annual General Meeting Birthday Party June 22nd, and in e-news editions throughout 2019. Share your thoughts in our Community Survey, or directly. Join us at events all year long, see our full event listings here. Earth Day – Great Galiano Shoreline Clean-up!